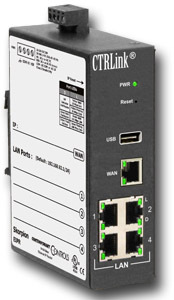 Contemporary Controls' EIPR Industrial Skorpion IP Router is an industrial grade router/switch with advanced features such as a stateful firewall, port forwarding, network address translation (NAT), port address translation (PAT) and dynamic host configuration protocol (DHCP) on both the LAN and WAN sides. The convenience of a built-in Industrial Ethernet switch eliminates the expense of installing a separate switch. The EIPR links two 10/100 Mbps Internet Protocol (IPv4) networks-passing appropriate traffic while blocking all other traffic. One network is the local-area-network (LAN); the other is the wide-area-network (WAN). The router's built-in firewall provides security by allowing an industrial network to communicate through the IT network to the Internet, while blocking unwanted communications from the IT network. Also, the EIPR incorporates a four-port Ethernet switch for multiple LAN-side connections. Using its DHCP server, the EIPR can provide IP addresses to devices connected on the LAN side while having its own IP address set via a DHCP server on the WAN side. An external Ethernet-based modem - cable or DSL - can be used to connect to the Internet. DSL modems connect via the PPPoE protocol. A USB port allows expansion to wireless networks. For a machine containing multiple Ethernet devices with multiple IP addresses, the EIPR allows the entire machine to appear as one IP address. If needed, all the control devices in the machine can be accessed individually from the WAN side by using Port Forwarding. The EIPR eliminates the need for multiple IPs from the IT dept or IP address changes for the control devices in the machine to match the customer network, thereby greatly simplifying the installation. The EIPR is webpage configurable via a standard web browser and can operate over the 0-60°C temperature range. Like other Skorpion Industrial Ethernet products, it is DIN-rail mountable and operates from a 24 VAC/VDC supply. Visit the EIPR product page to learn more.